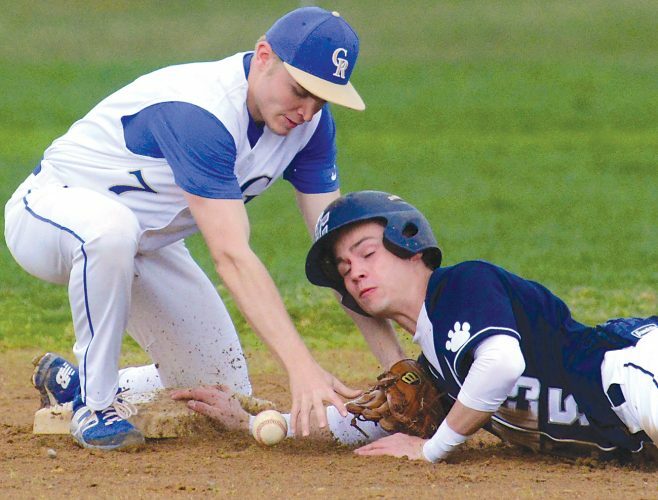 BELLWOOD — Bellwood-Antis baseball coach Steve Conlon likes his team’s chances when sophomore right-hander Travis Luensmann is on the mound, particularly if the Blue Devils score early. And, that was the case Tuesday. This time, Luensmann supplied both the offense and the pitching as Bellwood beat Portage, 5-2, in the District 6 Class 2A quarterfinals. The third-seeded Blue Devils will face second-seed Bishop Guilfoyle in the semifinals on Friday at Vets Field. The Marauders dispatched Blairsville, 7-1, Tuesday. “With Travis on the mound and you get some runs early … well, they aren’t going to get many off him,” Conlon said, smiling. Ian McFarland doubled to lead off the B-A first inning and, with one out, Luensmann socked a homer over the center field fence to give the Devils a quick 2-0 lead. It was Luensmann’s second homer of the season, the other coming at Glendale. “I just try to hit the ball somewhere, and hard,” Luensmann said. McFarland also hit a sacrifice fly and drew a walk. “Ian had a good day at the plate,” Conlon said of McFarland. “He got us started a couple of times. He’s a senior leader and gets on base at the top of the order. “Then Travis’s homer gave us a comfortable lead,” Conlon noted. Comfortable being 2-0 after one inning. B-A added single runs in the second and third innings. In the second, Mark Stewart singled, stole second, moved to third on a wild pitch and scored on McFarland’s sac fly. In the third, Luensmann singled, advanced to third on Jack Showalter’s single and scored on Troy Walker’s fielder’s choice to make it 4-0. Portage had some early opportunities as Luensmann walked three and hit three others in the early innings but the lanky Bellwood sophomore kept the Mustangs off the scoreboard. “Travis usually doesn’t hit that many (batters),” Conlon said, “but he was getting more movement on his two-seamer inside. “He’s usually a little sharper, but he was still pretty good,” Conlon added. Portage used an all-right-handed lineup against Luensmann, who struck out 10 while giving up one run and three hits in 6 1/3 innings. He left in the top of the seventh after throwing his 100th pitch. “When you strike out 11 times and leave nine on base, you don’t give yourself much of a chance to win,” said Portage coach Larry McCabe. “We certainly had some opportunities and we gave them a couple, too. “Bellwood has a nice club, though, and I wish them luck,” McCabe added. Game notes: Alex Schmoke doubled home B-A’s fifth run in the sixth inning. …Bellwood is now 18-3. … Portage, which finished 11-7, scored runs in the fifth and seventh. … “We had been playing well the last seven or eight games,” noted McCabe, who has guided the Mustangs for 40 years. … Travis Luensmann plays travel ball for the Mid-Atlantic Red Sox of Maryland. … His older brother, Chad, plays at Nebraska University but sat out this season after having Tommy John Surgery. PORTAGE (2): Kozlav 2b 400, George r-lf 201, Wiggins ss 211, Randazzo lf-cf 400, Kerch p-rf 300, Haney cr 000, Irvin 3b-p 300, M. Koenigsberg c 000, Chobany dh 100, Herman pr 000, A. Koenigsberg 1b 200, Piatek ph 100, Price cf-3b 211. Totals — 24-2-3. BELLWOOD-ANTIS (5): McFarland 2b 211, Tre. Walker cf 400, Luensmann p-3b 422, Showalter c 301, Tro. Walker 1b 200, Whaley rf 300, Stewart 3b-p 211, Dorminy pr 010, Kost lf 000, Plank dh 302, Schmoke ss 101. Totals — 24-5-8. E–Kozlav, Schmoke 2, Showalter. 2B–McFarland, Schmoke, Wiggins. HR–Luensmann. RBI–Luensmann 2, Schmoke, Tro. Walker, McFarland. WP–Luensmann. LP–Kerch. SO–Luensmann 10, Stewart 1, Kerch 6, Irvin 1. BB–Luensmann 3, Stewart 1, Kerch 4, Irvin 1. Records: Portage (11-7); Bellwood-Antis (18-3).